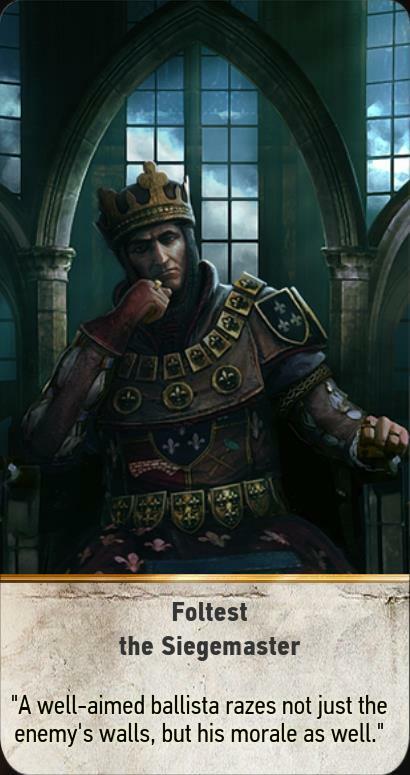 Foltest the Siegemaster is a Gwent Card in the Witcher 3: Wild Hunt. "A well-aimed ballista razes not just the enemy's walls, but his morale as well." Leader Ability: Doubles the strength of all Siege units, unless a Commander's Horn is already in play on that row. Hi there. I already won the Nobleman in Wyzima about 5 or 6 times, but he just doesn&apos;t give me the card. Does anyone else have this bug?